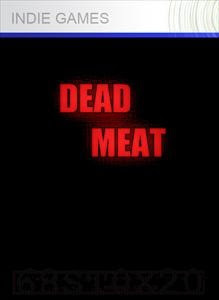 Dead Meat is a Indie game on X-Box Live. It is 80 Microsoft points, and came out roughly the same time as the superior I MAED A GAM3 W1TH Z0MB1ES!! !1 a game with zombies in it. 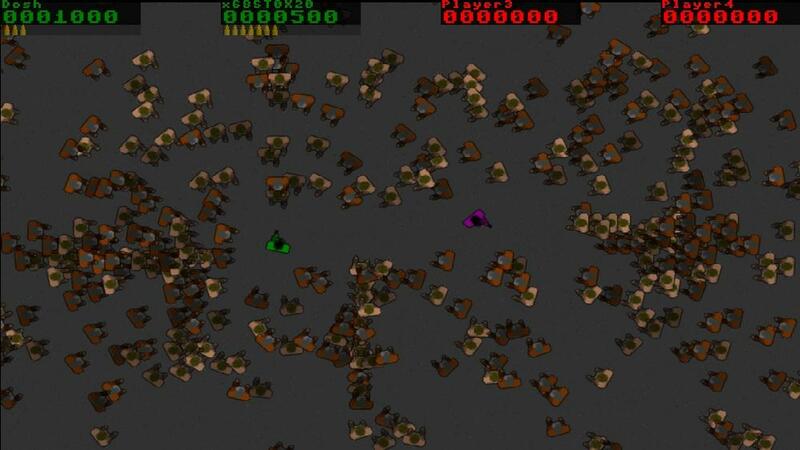 Like that game and many other indie zombie games it is played in the overhead perspective. 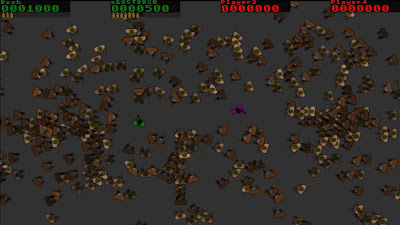 Nearly a twin stick shooter; The left analogue moves your little man around, while the right analogue aims your pistol, the shoulder button fires your gun. The game has no plot to speak off, but in my mind the man you play as is evil, he got his just desserts by being abandoned when the good guys made off in his helicopter. Luckily for him he has infinite supplies of ammo, but can he survive the thousands of incoming (though very slow) flesh hungry zombies? The game starts off really easy, and it takes a fair bit of time for the game to heat up. Your pistol holds around eight bullets and then needs reloading. Pick ups include a hunk of meat (dead meat?) that increases the number of zombies arriving on screen, a stealth suit that reduces the number of enemies arriving, as well as an unlimited gun clip, and a clip that fires three bullets at once. It is quite cool that the characters aim isn't perfect, some shots go wide giving more of a sense of realism to proceedings. Pick ups can be combined, for instance if you have the three way shot and you collect the unlimited ammo clip then you now have the perfect weapon of a three way shot gun that doesn't need reloading. Your main guy has a bright green top. He is identical to the zombies except that they have dull coloured tops on, and they have legs (For some reason your character doesn't appear to have any!) The zombies all walk silently towards you, some are faster than others. The only sound is the gun firing (a nice echoy sound to it) and the splat and squelch as enemies vanish in a blood splat. The area you are in is grey, and boring, but killed enemies leave a red smear behind on the ground. The title screen has ace music, so it's a shame that the actual game has no music. The game is up to four players, though as usual I only got to play this single player. The game is ok, but is a bit boring to be honest. Later on the number of zombies increases dramatically. Below is the video of my final moments playing the game!